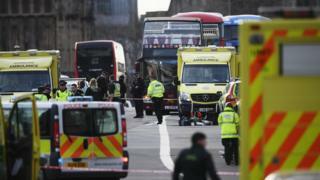 Pedestrians tried to escape the "chaos" of the 2017 Westminster terror attack but never stood a chance, a witness has told the inquest into their deaths. Kylie Smith, a teacher accompanying a group of children, described seeing Khalid Masood's car hit people. "It was very clearly a deliberate act. The way he turned the car to change the direction," she told the Old Bailey. Four people were killed on Westminster Bridge before PC Keith Palmer was stabbed to death outside Parliament. "It was chaos. It was just chaos," Ms Smith told the hearing. "People trying to get out of the way but nobody really had a chance." 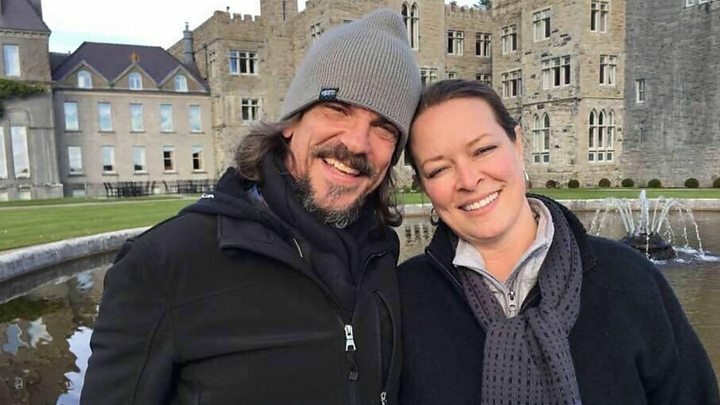 Those killed in the attack on 22 March last year were Kurt Cochran, 54, Leslie Rhodes, 75, Aysha Frade, 44, and Andreea Cristea, 31. Ms Smith said she saw American tourist Mr Cochran and his wife Melissa "walking hand in hand... having a nice time". "The car came towards them. The man tried to pull his girlfriend behind him, tried to shield her from the impact," she said. Police say the attack began at 14:40 when Masood's vehicle, a rented Hyundai Tucson SUV, mounted the kerb on Westminster Bridge, travelling at an average speed of 31mph. Mr Cochran - who was standing with his wife at the south side of the bridge - was the first to be hit. Giving evidence, Mrs Cochran, from Utah, told the inquest they had been sightseeing for two and a half hours before the attack. She said: "I remember hearing a car revving. I remember seeing the front of the vehicle. The next thing I remember, being on the ground." Mrs Cochran, who spent about a month in hospital recovering from serious injuries, said she did not recall being pushed out of the way by her husband, but said such behaviour was "typical" of him. Another witness, Neil Hulbert, described how he heard an "almighty crash" and saw Mr Cochran "flying through the air" over the balustrade of the bridge. He said: "I guessed some sort of vehicle was involved, just the way he was ejected over. I did not notice there was any movement from him as such. I knew then it was going to be serious." Paramedic James Richards said he arrived at the scene minutes after the attack. "Initially we saw several abandoned vehicles, many people moving in different directions, casualties around clearly injured, generally a scene of chaos," he said. "I remember approaching several casualties and checking each was conscious, breathing." He was then informed Mr Cochran was on the embankment below the bridge and attended to him. At first Mr Cochran had "rasping" breath, the paramedic said, but his condition deteriorated over the next 17 minutes and he was pronounced dead as Big Ben was chiming at 15:00. The inquest is examining the circumstances surrounding the deaths of the five victims in what Judge Mark Lucraft QC, chief coroner of England and Wales, has described as "82 seconds of high and terrible drama". Retired window cleaner Mr Rhodes, from south London, died after being knocked into the air and dragged by Masood's car. Dr Gareth Lloyd helped treat Mr Rhodes in the road before paramedics arrived, and he then travelled with him to hospital. He told the coroner he had been walking on the opposite side of the bridge from where the attack unfolded and saw Masood's vehicle "gathering pace rather than stopping" and hit three people as it was driven "intermittently off and on" the pavement. Dr Lloyd said it appeared Mr Rhodes, who died in hospital the following day, had an "unsurvivable injury". The inquest heard the air ambulance had been on its way to help him before apparently being diverted and sent to PC Palmer. And lawyers for his family raised the question of whether this could have led to a delay in his treatment. Ms Frade, a school PA, was thrown 17 metres into a bus lane, then fell under a slow-moving oncoming bus. Romanian tourist Ms Cristea was knocked into the Thames from the bridge and was in the water for nearly nine minutes before being rescued. She died in hospital just over two weeks later. After crashing his car into a fence outside Parliament, Masood - armed with two knives - ran into the Palace of Westminster's Carriage Gate. Who was attacker Khalid Masood? PC Palmer, 48, who was unarmed, challenged him but was forced backwards and stabbed. Masood was shot by plain-clothed armed officers and later died. The inquests, which are expected to last up to five weeks, will be followed by a separate jury inquest for Masood. There were tears and the occasional smile as those caught up in the attack on Westminster Bridge gave evidence on the second day of the inquest. At times during her evidence, Melissa Cochran smiled when she spoke of her husband, Kurt. "We had one day in London so we were cramming everything in we could," she said. Kylie Smith, a teacher who was with her students on Westminster Bridge, cried as she recalled seeing Mr Cochran being hit and the chaos and panic that followed. She described seeing the couple holding hands before Mr Cochran was run down and said it seemed like they were having a good time. Dr Gareth Lloyd, who was also on the bridge at the time of the attack, tried to help Leslie Rhodes. In a touching moment at the end of his evidence he thanked the family for inviting him to his funeral and said it was a privilege to attend. Westminster terror attack: Who were the victims?